Steve Buttry, from The Buttry Diary, a must-read for so many of us in journalism and education. 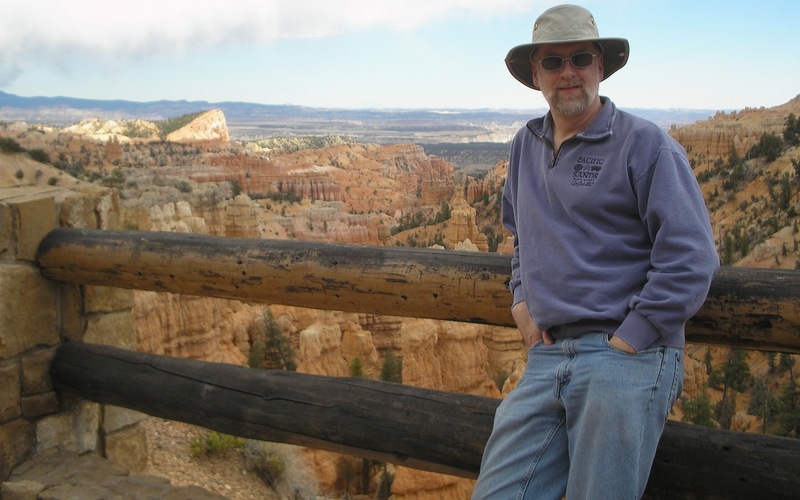 Buttry posted this photo in his final blog post, writing, "Our 2007 visit to Bryce Canyon came eight years after my first cancer diagnosis." Steve Buttry told me exactly how I will not start this tribute to him. I will not say he lost his battle with cancer Feb. 19, 2017, at age 62. He was disciplined and productive, yet he embraced joy. He was principled and passionate, yet he entertained counterargument freely. I felt truly fortunate to call Steve a friend. We did not know each other long, but he had this unique way of making you feel you knew each other well. His style was one of bracing frankness coupled with abiding kindness. I remember talking with him about that 2014 Cancer 2.0 blog post. I told him I didn’t think I had that kind of bravery in me, and he responded that we never quite know what’s in us until our mettle is tested. Steve’s remarkable career began as small-town journalist, transitioned to respected newsroom trainer and innovator, and ended as beloved teacher. You can read about the many peaks along the way in the final post to his blog, The Buttry Diary, which became over the years a must-read for so many of us in journalism and education. And then something beautiful happened. Weingarten suggested The Buttry Diary be rebranded as “Mmm. Smooth Buttry Goodness.” Always open to a good laugh, Steve built the idea into a fundraising campaign for the American Copy Editors Society Education Fund. When donors surpassed his goal of $500, he rebranded for a month. When I met him in person for the first time, I pointed to the brilliance of that post. It was funny as hell, attracting plenty of shares and attention. That was Steve. He was always the magnet in a room, entertaining and engaging. But the post also made fantastic arguments on the topic and included Weingarten’s opposition. That was also Steve. He was never the loudest or the last in the room. He made space for sharing but also for listening. Over the next few years, we would come to work together on the Online News Association BYO Ethics tool and posts for EdShift. Steve managed to maintain a set of qualities I deeply admired. He was disciplined and productive, yet he embraced joy. He was principled and passionate, yet he entertained counterargument freely. He was out front publicly about his health struggles, yet he focused fully on his family, closest friends and true soulmate, his wife, Mimi. When I learned Steve was ending treatment for his latest cancer, I cried. And then I sent him some barbecue, another of his abiding loves. I wrote to him that I still wasn’t sure I had his bravery, but I was deeply grateful for the chance to tell him how much I admired him — professionally and personally. His blogging was a gift, especially in letting all of us know now was the time to honor his goodness — Smooth Buttry and all. No, Steve did not lose his fight with cancer. He won his battle for our hearts and minds. Kathleen Bartzen Culver is an assistant professor in the University of Wisconsin-Madison School of Journalism & Mass Communication and director of the Center for Journalism Ethics. Long interested in the implications of digital media on journalism and public interest communication, Culver focuses on the ethical dimensions of social tools, technological advances and networked information. She combines these interests with a background in law and free expression. She also serves as visiting faculty for the Poynter Institute for Media Studies and was the founding editor of MediaShift’s education section. Late to finding this tribute to Steve. His mentoring and friendship to so many of us was such a great gift. He and his wisdom will be greatly missed.